Rockstar Energy Water is an enhanced water beverage line from Rockstar Energy. 2016: Energy water has been completely discontinued. In the UK Energy Water is slightly carbonated being released in a 355 ml can which have around 120 mg of caffeine. The 3 Canadian flavors are sugar-free and have a blend of caffeine, guarana, ginseng, B-vitamins, and taurine. The 2 UK flavors of Rockstar Energy Water contain 50% less sugar than regular Rockstar. Rockstar Energy Water seems to be trying to compete with successful Vitamin Water owned by Coca-Cola, but with MUCH more caffeine. The Energy Water line will appeal to people who want a hydrating energy boost without sugar or carbonation. 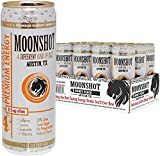 Rockstar launched this product in Australia and The USA back in 2010, but it wasn't successful there. Perhaps Canada and the UK will embrace Rockstar Energy Water. 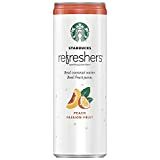 8 Pack - Starbucks Refreshers - Peach Passion Fruit - 12oz. How Does Rockstar Energy Water Compare? Rockstar Energy Water contains 9.00 mgs of caffeine per fluid ounce (30.43mg/100 ml).